It’s a no-brainer that athletes stand as an influential pillar for a healthy lifestyle, holding an influential role for a broad consumer base and being associated by default with fitness. The Ricky Davis Legacy Foundation, a non-profit organization established and founded by NBA star and 13-year veteran of professional athletics Ricky Davis. The celebrated athlete is using his span with several NBA teams to give back, and his latest move was to team up with Brothers Produce in Houston, Texas, to hand fresh produce and groceries out to the homeless. “The foundation is really big on nutrition, so that’s why we hooked up with Brothers Produce to get them the fresh fruits and fresh vegetables they don’t get every day,” Davis told Fox 26 Houston in a video interview, expressing surprise and sympathy for how many people do not get the fresh produce they need. At a time when movements like FNV, Produce for Kids, and more are looking to sway children towards picking fresh produce, Brothers Produce CEO Brent Erenwert told me he is hoping to see other produce people reach out to a demographic already won by our industry but without the means to enjoy it. Brent shares that the team is packing plastic bags with various produce items such as apples, bananas, berries, grapes, grapefruit, oranges, peaches, and plums before adding various toiletries like deodorant, shampoo, soap, toothpaste, and toothbrushes. Ways to donate or help include providing product, services, volunteering, and/or donations towards the goods. “Every little bit helps and together as an industry, united, we can make a difference in so many people’s lives,” Brent concludes. 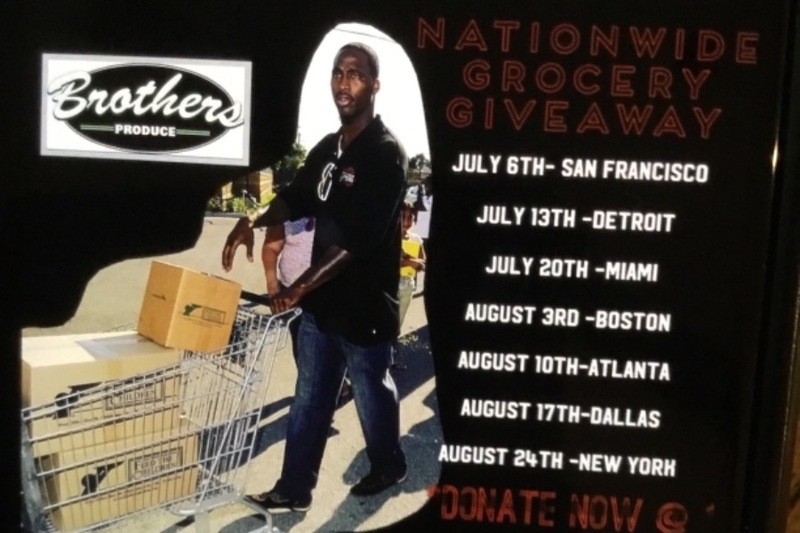 Brothers Produce and the Ricky Davis Legacy Foundation are continuing to make an impact through fresh produce across the nation, with upcoming grocery giveaways slated for San Francisco, Detroit, Miami, Boston, Atlanta, Dallas, and New York City. These cities are all part of the Big 3 League tour. Please contact Brent Erenwert with questions to donate or to learn how to get involved. The donations received will be used to buy extra supplies, police escorts, socks, shoes, and various other expenses that come up throughout this amazing campaign. Special thanks to Brandiq for their generous donation of deodorants, tooth brushes, and tooth paste for the events. Also special thanks to Four Seasons hotel for their donation of shampoos and conditioners. Special thanks to Daylight Foods for donating products, truck, and a driver for the San Francisco drop next week. I will personally be flying out to oversee this drop. I am very excited to be a part of such a great cause.